It’s a sad week for the house community due to the news of the death of legendary vocalist Colonel Abrams over the Thanksgiving weekend. The 67-year-old Detroit-born soul singer seamlessly transitioned into house-laced dance tracks in the 1980s with hits like “Music Is The Answer” and his 1985 crossover anthem “Trapped”. Colonel Abrams—and yes, that was his real name—fell on hard times in the last years of his life, prompting DJs Tony “Tune” Herbert and Marshall Jefferson to start a crowdfunding campaign in 2015 to help him out of homelessness and ill health. Abrams will be remembered as one of the iconic voices of classic house music, and if you’re new to his work, we suggest you start with the below guide. Colonel Abrams, "You Got Me Running"
When it comes to the origins of house music, there’s a lot of talk about who did what, when and where, and I do not intend to complicate the matter even further. The legend of “You Got Me Running” is that it was part of an eight-track tape Colonel Abrams produced with Boyd Jarvis and Timmy Regisford as early as 1982, and a lot of the legendary DJs in New York City and Chicago and beyond rinsed it. Even if this track was officially released two years later than the tape that contained “You Got Me Running” (which was still circulating on the DJ circuit), it was still one of the most important proto-house artifacts. And it is easy to understand why it had such an impact, as all the elements that were to define the imminent early house records were already there. Thus it was preceding what was to come way in advance, and this 1984 gem will forever stand out as a landmark track in the history of house music. “Trapped” is still a house prototype, but at this point he had paired his inimitably determined vocal style with the shoulder pads and fierce dance moves of the day and stormed the charts. It was about time! This was the second hit from his breakthrough glory year. “Speculation” has handclaps galore and another bold funky groove, and it was mixed by NYC club music protagonist Timmy Regisford. “Over And Over” was a mighty-fine demonstration that Colonel Abrams could navigate his way beyond punchier dance floor imperatives. 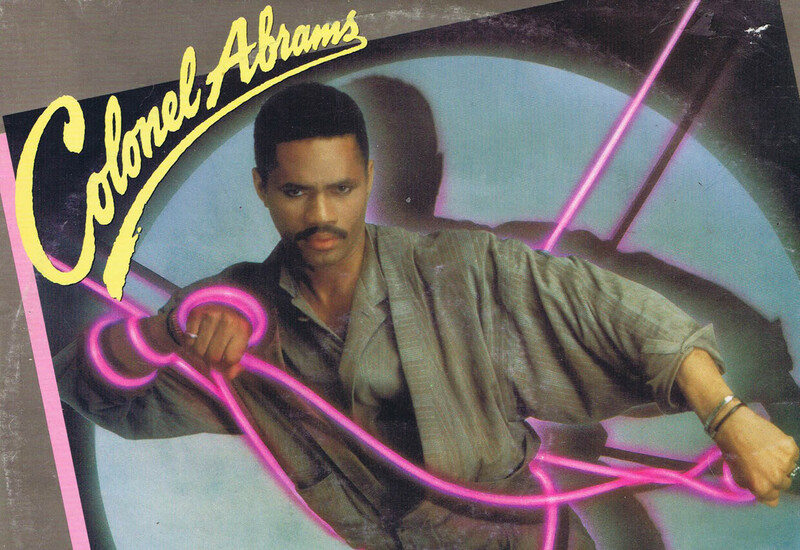 It’s a slick and beautiful R&B ballad that’s both in tune with other productions of the mid-’80s post-disco reality. and still very much him doing the thing he created. This is basically a sequel to “Trapped”, and some would say it’s even more irresistible. I’m probably one of many mid-’80s clubgoers who observed this track’s long lifespan and its relentless ability to make everyone dance each time it was played. It still does. Colonel Abrams still rode his sound in 1987, only adding a bit of the piano stylings introduced by the Chicago house producers for whom he paved the way. By then he faced a lot more competition in club music, and his efforts to satisfy the pop market with slower R&B tracks suffered from his lack of distinctive hits. Sadly he seemed to get lost in the middle and his promising career slowed down considerably. Still, this is up there with what earned him such high regard in the first place. After a failed attempt to revive his career as a soul singer with a 1992 album on the Scotti Bros. Label, Colonel Abrams retreated to working as a feature vocalist for hire on house records throughout the rest of the ’90s. Even if his voice still stood out as ever, many of these said releases lacked the potential to re-establish him on a level worthy of his beginnings. Thankfully he found a fitting production counterpart on a string of records he made with the U.S. garage dons Smack Productions/Mental Instrum. And yes, this is the original template for DJ Dove’s holy grail “Organized”. This is another supreme example of the congenial drive and fierceness of the collaborations between Colonel Abrams and the Smack camp. Eventually they released an album that compiled all their finest moments together, but it failed to get his career on track again. By this point he settled with guest spots on club music records—or had to—with mixed results. Sadly, nobody had the idea to give him the opportunity, team or budget to reinvent himself as the soul singer he should have been, and he vanished from sight. One of my most memorable moments from working at Berlin’s Hard Wax record store was when I discovered that Omar S had done this record with Colonel Abrams after the latter’s years of silence. I was floored by how good it was. In a way his career had gone full circle, with beautiful music produced in way that made both the song and his breathtaking voice shine. I was really sure that this record would not be the last time I ever heard him on a new record—but it was. I was shocked to learn about the troubles he had, and that they eventually led to him passing away, so I cannot separate this song from his incredibly sad story. But what a song!